Background: Effective non-surgical treatment of morbid obesity continues to elude the medical community. Capturing positive effects of Roux-en-Y gastric bypass (RYGB) without surgery may be essential in achieving this goal. We have previously shown that patients experience taste changes and aversions following RYGB. A rat model for RYGB can help define these changes as physiological in the absence of psychosocial human influences. We hypothesize that rats will develop taste changes and aversions following RYGB. Methods: Four Sprague-Dawley rats underwent RYGB and four rats had a sham operation. The two groups completed taste-salient behavioral tests to assess gustatory responsiveness (measured as lick rate over 10 second trials and number of trials initiated) to a battery of taste stimuli. Sweet taste stimuli offered were 5 different concentrations of glucose solution (0.01 – 1.0 M). The results of the two groups were compared using Mann-Whitney tests. Results: RYGB rats initiated an average of 15 – 36% fewer trials than sham rats for the 5 concentrations of glucose. 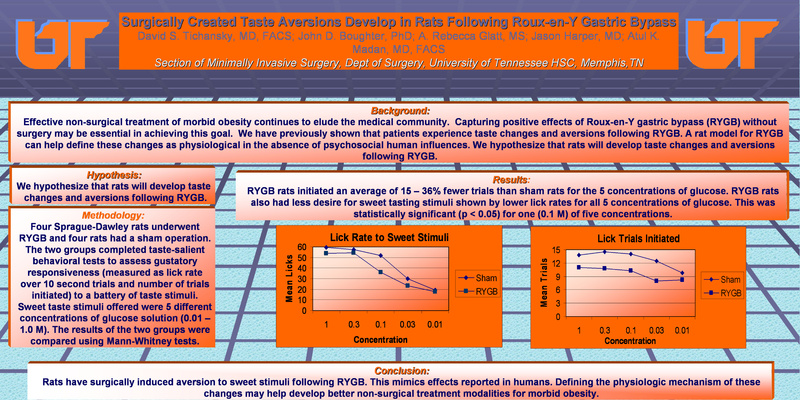 RYGB rats also had less desire for sweet tasting stimuli shown by lower lick rates for all 5 concentrations of glucose. This was statistically significant (p < 0.05) for one (0.1 M) of five concentrations. Conclusion: Rats have surgically induced aversion to sweet stimuli following RYGB. This mimics effects reported in humans. Defining the physiologic mechanism of these changes may help develop better non-surgical treatment modalities for morbid obesity.